No picture on monitor Power problem Check the monitor power cord, digital video cable, and power strip. Loose or faulty video cable Verify that the digital video cable is firmly connected from the monitor to the computer. While the monitor is powered ON, disconnect the video cable. You should briefly see a message on-screen saying No Signal if the monitor is working. Check the digital video cable and make sure it is not pinched or frayed. Connect the cable to a different monitor to verify the signal. Loose or faulty video card When the computer boots up, it performs a PC self-diagnostic test. If you hear 3 beeps from the computer, this indicates a problem with the video card. If the video card is faulty, contact Technical Support. Make sure the video card is seated properly in the motherboard. Reseat the video card as needed. Check the power connector to the video card inside the computer. Make sure it is connected properly and is not connected backwards. Power on the computer and make sure the fan on the video card is spinning fast. HD software version running on SVGA system Conversion cabinets with SVGA (CRT) monitors must run the SVGA software and the SVGA Patch. See the Software Restore Guide for Kit Systems for complete instructions. Poor video quality SVGA software version running on HD system Games with HD monitors (LCD or plasma) should run the HD version of the game software. The SVGA version runs in a lower resolution. See instructions in the Software Restore Guide. Picture is dim or faded Video output needs adjustment Use the monitor Remote Control PCB to adjust the monitor. Picture color is poor Color needs adjustment Use the monitor remote control board to adjust the red, green, and blue color settings. Use the Color Bar Screen under Screen Check in the Operator Menu to aid with color adjustments. Picture geometry is misaligned Geometry needs adjustment Use the monitor Remote Control to adjust the picture height and width, and other geometry. Use the Cross Hatch Screen under Screen Check in the Operator Menu to aid with the adjustments. Corrupted software Reload the software from the disks. If you continue to have problems, you may have a faulty hard drive. Faulty hard drive If you continue to have problems after you reload the software, you may have a faulty hard drive. Contact Technical Support. Note: Only the Left & Right front audio channels are used. Use Sound Options in the Operator Menu to raise the volume. To verify audio is working at the computer, connect stereo headphones to the green computer audio port. Faulty wiring Verify that all the wires are firmly connected to the speakers, GVRI/O PCB, and green computer audio port. Verify that each wire is connected to the correct port and no wires are frayed or improperly shorting to ground. Blown speakers Remove the grill and inspect each speaker for visible damage. Run the Speaker Check from Sound Options in the Operator Menu to verify each speaker is working. Reversed wires A weak or low muffled sound is a sign of reversed speaker wires. 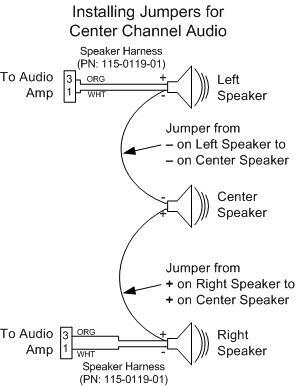 Check for reversed wires on each speaker. Faulty Audio Amp To verify audio is working at the computer, connect stereo headphones to the green computer audio port. Audio hum Faulty power supply A constant low hum in the speakers can be caused by a faulty power supply. This could be either the external DC power supply or the computer power supply. Open ground Check all ground wires in the cabinet. Make sure AC wall outlet is properly grounded. with computer on Avoid hot-connecting any devices to the system computer. Reboot the game to remove the dialog box. This is an issue with newer motherboards. Buttons do not work Faulty micro switch Replace the micro switch on the button and re-test. Verify that the wires are connected to the correct spades on the micro switch. Faulty wiring Disconnect the cabinet from AC power. Verify that all wires are firmly connected to each button and the GVRI/O PCB. Verify that no wires are frayed or improperly shorting to ground. Verify that wires are connected to the correct spades on the micro switches. Faulty GVRI/O PCB Make sure that all connections to the GVRI/O PCB are secure. Replace PCB if faulty. Caution: Disconnect cabinet AC power cord before making any connections to guns. Failure to do so may damage gun components. GUN BOARD CONNECT ERROR message at boot Faulty wiring Verify that all wires are firmly connected and no wires are frayed or improperly shorting to ground. Disconnected USB or DC power Check all power and USB connections. If all gun lights are off, this indicates a problem with +12 VDC power. Blown fuse in gun power harness Check the fuses (MDL 2A Slo Blo) in the gun power harness. Gun(s) connected to faulty USB port To test a USB port, turn off the game, disconnect the device from the port, and then connect the game dongle to the port. Reboot the game. A No Dongle message indicates the port is bad. If the game starts, the port is working. After the test, turn off the game, reconnect all devices to the correct USB ports and reboot. Important: Disconnect power before changing any USB connections. Guns connected to wrong USB ports If using the PCI USB ports, check the label above the ports on the computer. If you replace the PCI USB card, you may need to use different ports. Faulty power supply Verify the external DC power supply is putting out the correct voltages. A button or trigger does not work Faulty micro switch or wiring Check micro switch inside gun. Check wiring. Make sure no wires are pinched in the gun case. No force-feedback recoil in gun Faulty DC power supply Make sure the external DC power supply is putting out +24 VDC. Solenoid turned off Set GUN SOLENOID/RECOIL to ENABLE under Game Options in the Operator Menu. Faulty coil Check wiring inside gun. Replace coil if faulty. Gun wiring is reversed To compensate, set GUN I/O SWAP to ON under Game Options in the Operator Menu. Gun out of Calibration Calibrate the gun using Gun Check in the Operator Menu. Faulty pot or gear Check gun pots and gears. Fuses blow Pinched wires Make sure no wires are pinched by the gun case. Faulty power supply Test voltage output and replace power supply if faulty. Ammo readout not working or looks strange Faulty Gun PCB Check all connections to the Gun PCB (it is powered by +5 VDC from the USB connection). Replace PCB if faulty. No power Power strip not plugged in or turned off Make sure the power indicator light on the power strip is on. If it is off, make sure the connections to the AC power plate terminals are secure and the power strip ON/OFF switch is ON. Cabinet not connected or turned off Make sure the AC power cord is firmly connected to the power plate and an active AC outlet, and the cabinet ON/OFF switch is ON. Blown fuse in power plate Check the fuses in the power entry module in the power plate. Cabinet gets very warm Faulty ventilation fan Verify that the ventilation fan is working. It is located under the vents at the top of the cabinet. Replace the fan if it is worn or spinning slowly. Make sure the fan is getting +12 VDC from the external DC power supply. Cabinet ventilation holes are blocked Make sure you have proper clearance between the cabinet rear and the wall. Make sure the vent holes are clear of dust and debris and that air can flow freely. Marquee lamp does not light or is intermittent Faulty florescent tube Check the florescent tube for darkened or cracked ends. Replace the florescent tube if it looks worn. Faulty florescent fixture Verify the florescent tube pins make a good connection with the lamp fixture. Check the ballast for proper operation. Replace fixture if faulty. Improper number of credits given when coins or bills are inserted Incorrect setting in Operator Menu Adjust settings from Coin Options in the Operator Menu. Faulty wiring Disconnect the cabinet from AC power. Verify that all wires are firmly connected to the coin mech and bill validator, and ground wires are properly connected. Verify that no wires are frayed or improperly shorting to ground. Faulty coin mech Verify the coin mech is not jammed. Make sure the coin mech is properly aligned and latched to the coin door. Repair or replace if faulty. LED Strip Lights not working Faulty wiring If your game has LED Light Strips for cabinet lighting, check connections to +12 VDC and ground. Click here for detailed information. (Indicates I/O PCB was not detected) GVRI/O Mini PCB is not connected Power OFF the game and then connect the USB cable from the I/O PCB to a USB port on the USB card. Faulty USB port or card Power OFF the game and connect the I/O PCB to a motherboard USB port for testing. (Indicates at least one gun was not detected) Gun(s) not connected Power OFF the game and then connect the gun(s) to a USB port on the USB card. Faulty USB port or card Power OFF the game and then connect the gun to a motherboard USB port for testing. (Indicates Game Dongle was not detected) Game dongle not connected Turn off the game, connect the game dongle to a motherboard USB port and then power on the game. Make sure the game dongle is connected properly. USB dongles illuminate when recognized by the computer. Contact Tech Support if you need to order a new dongle.